'Page-turning and gritty' DAILY MAIL. It is 1943 and for agents of the Special Operations Executive, a mission to Nazi-occupied Paris is a death sentence. So why has unlikely spy Harry Mitchell volunteered to return to the city he fled two years ago? The French capital is at war with itself. Informers, gangsters, collaborators and Resistance factions are as ready to slit each other's throats as they are the Germans'. The occupiers are no better: the Gestapo and Abwehr - military intelligence - are locked in their own lethal battle for dominance. Mitchell knows the risks but he has a reason to put his life on the line: his family are still in Paris and have fallen into the hands of the Gestapo. With disaster afflicting his mission from the outset, it will take all his ingenuity to even get into the capital... unaware that every step he takes is a step closer to a trap well set and baited. 'Night Flight to Paris is everything a thriller should be: fast-paced with great characters, life or death jeopardy and nail-biting action. David Gilman delivers the goods once again. A terrific read!' MATTHEW HARFFY. 'Absolutely amazing. I'd never thought that another writer could rival Bernard Cornwell ... The level of suspense is ratcheted up to a truly brutal level' SHARON PENMAN. 'A gripping ride through a memorable period of history' WILBUR SMITH. 'Night Flight To Paris is everything a thriller should be: fast-paced with great characters, life or death jeopardy and nail-biting action. David Gilman delivers the goods once again. A terrific read!' Matthew Harffy. 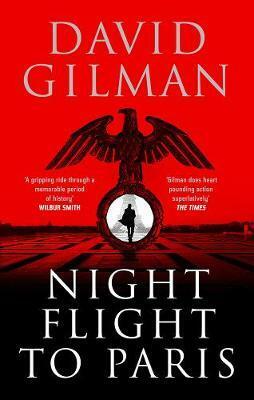 'David Gilman's superb war thriller is a tale of overwhelming courage, evil and treachery, presenting a portrait of occupied Paris that is both terrifying and engrossing' Sunday Express.